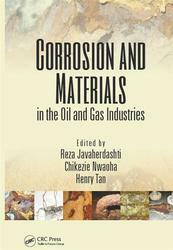 Corrosion and materials in the oil and gas industries, Reza Javaherdashti, Chikezie Nwaoha, Henry Tan. This book contains information obtained from authentic and highly regarded sources. Reasonable efforts have been made to publish reliable data and information, but the author and publisher cannot assume responsibility for the validity of all materials or the consequences of their use. The authors and publishers have attempted to trace the copyright holders of all material reproduced in this publication and apologize to copyright holders if permission to publish in this form has not been obtained. If any copyright material has not been acknowledged please write and let us know so we may rectify in any future reprint. SUBSEA OIL AND GAS PIPELINE INTEGRITY MANAGEMENT UNDER AGING CONSIDERATIONS. Corrosion, together with other mechanisms, causes material aging. Thus, integrity management under aging considerations becomes an important problem. Oil and gas operations in the United Kingdom Continental Shelf (UKCS—North Sea) rely on a vast number of pipeline assets in order to bring the produced well fluids to shore or to offloading production facilities. As time moves on, more and more of these pipeline assets will reach, or in fact have already exceeded, their intended design life and may in fact have a reduction in their mechanical strength properties, in terms of wall thinning, as a direct result of corrosion. In this case, there would be an immediate need for work to be undertaken in order to demonstrate that they were fit for service in terms of technical integrity and continued safe operation.